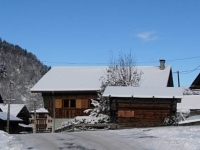 A truly authentic traditional chalet for rent in the heart of the French Alps. 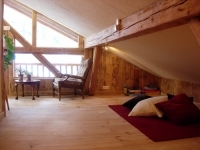 This enchanting chalet is ideal for up to 12 people. It is situated on the edge of the village of Salvagny, on the boundary of the national nature reserve. It is close to the lifts and pistes of Sixt Fer a Cheval and at the start of many superb walking and biking trails. A great location for active family and group holidays providing an "away from it all feel" whilst at the same time easy access to a whole world of adventure. 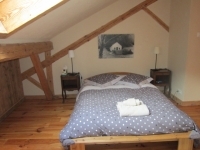 Nearly 200 years old a beautifully converted farmhouse with spectacular views of the mountains, waterfalls and forests. 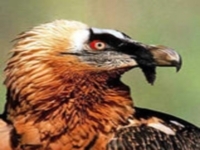 And if you are blessed with good fortune a lifetime opportunity to view the nesting bearded vulture (gypaete) from the chalet balconies. Perfect for skiing, walking and adventure activities during winter, spring, summer and autumn seasons. 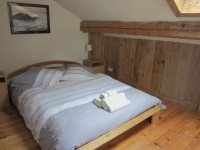 Five bedrooms, all en suite - three double bedrooms with standard double beds. Two further bedrooms - one with four singles as bunk beds and one with two singles. All bedrooms have en suite bathrooms with shower, washhand basin and WC. A snug area on the second floor for reading/games etc. A fully equipped kitchen with dishwasher and fridge/freezer, electric oven, 6 ring gas hob and microwave. 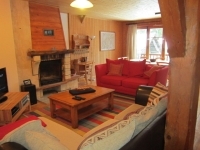 A large spacious sitting room and dining area with log-burning stove. WIFI, TV, DVD, CD system and freeview. Balconies with views towards the Piste de Cascades and its waterfalls. Shared Utility Room, with washing machine dryer. Shared Bootroom, ski store and drying area for all equipment and outdoor clothing.